Students can be dropped off in the gym no earlier than 7:30 and we start our morning assembly, Pledge of Allegiance and announcements at 7:45. St. Thomas Aquinas students bring lunch from home. We encourage an adequate, nutritious sack lunch. We strongly discourage fast foods brought to school at lunchtime. We do offer lunch-for-purchase Mondays, Tuesdays & Fridays. Information on this is available at the beginning of each school year. All students may bring a nutritious morning snack. 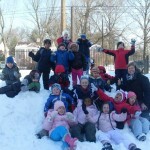 Weather permitting, all St. Thomas students have outside recess each day and twice daily for grades K-2. Kindergarten: Students work in classroom which includes a mixture of learning and play in order to develop both academic and social skills. Days include reading, writing and math manipulations through learning stations as well as science, social studies, religion, large muscle movement, recess and snack time. Elementary School (1st – 5th Grades): Students do much of their work in classroom with whole group lessons and small group instruction as well as specials throughout the day. They also participate in 90 minute reading and 60 minute math blocks on a daily basis. K-4: Our A-Z reading program allows students to read at their own level in multi-age groups. Middle School (6th, 7th & 8th Grades): Students move from classroom to classroom throughout the day in middle school. Their classes may be divided into sections to allow instructors to work with smaller groups in the basic classes and to allow for multiple levels of instruction in math, English and reading.